I have been pondering about having a delivery . Was looking at Riverford boxes and the meat, all looks good also Abel & Cole... all quite pricey ...I am swaying towards Riverford .Do any of you have a veg box delivery? My next door neighbour has a veg box from Abel and Cole who also deliver meat, yoghurt and eggs weekly. She is pleased with them on the whole but they did once leave somebody else's box by mistake when she was away. 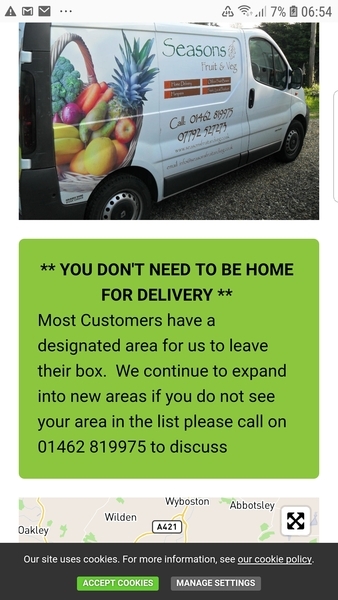 For years we were a delivery drop off point for a local veg box scheme. We took one ourselves too. It's a great idea for helping the smaller growers while also eating seasonal food. The quality is generally good although it varies. We don't do it now as we have a local shop which sells the same fruit and veg. I sometimes use a local supplier. It's all been excellent produce, sometimes including things supermarkets don't stock here, such as Romanesque, and it lasts for ages as it's picked the day before. We have been having a box from Riverford for a few months now and I am impressed with the quality. Find their website really easy and so each week I can choose which box to have and add extras if I want. Have not tried their meat because I like to support our local butchers. I have used Riverford for years. I do not often have the fixed box but choose exactly what I want. Great quality with real flavours and textures. I have used Riverford for several years. It allows flexibility, so I can chop and change my deliveries- every week, once a month etc. Less in the summer when I have produce from my own garden. Overpriced. You can get all the stuff they sell at local markets and much cheaper too. Half the items aren't even grown in the UK so you are supporting so called 'slave labour' in Italian and Spanish polytunnnels and root veg from the USA yet Riverford say they do not airfreight goods. That means veg and fruit are shipped here which takes much longer. If you want organic, buy seasonally from your local farm shop or market or grow your own. There is certainly a price difference but Riverford is organic and ethically farmed and sourced. The company is now owned mainly by its employees and has an ethos of little waste, environmental responsibility and just good food. I have an organic veg box delivered from East Coast Organics every fortnight and even at that spacing I often find myself making mixed vegetable soup to use it up before the next imminent delivery. I have made some interesting combinations! There is always plenty of dirt!. My cynical son suggests that they are buying in exactly the same mass-produced veg as the supermarkets and dip it all in a bucket of liquid mud to make it look organic. I am sure they would be horrified at the thought! I have Abel and Cole. You can pick what you want/don't want to have. You get good introductory offers and can buy a good selection of add ons. I have a small box. They are not cheap but I have found them good and reliable. Am very tempted. And it would encourage me to eat more veg rather than waste it! I had Abel & Cole deliveries for about 18 months, just fruit and veg. The quality was mostly good but the prices became unreasonable ( £2.99 for a melon smaller than the average grapefruit?!) so I didn't continue. At that time, I was getting my online supermarket deliveries from Ocado and used to order one of their medium veg boxes with each delivery and found them to be excellent value. I've now switched to a different supermarket which I'm very content with -but I do miss the veg boxes! Although I am a big fan of the company I use and the veg I buy I must admit (and I had forgotten) that I do choose carefully what I buy. Certain things are, to my mind, just not worth it. Root vegetables are always very superior, they are denser and have a lot more flavour thus a few carrots make a wonderful really tasty soup. Things like cabbages and spring greens are also very fresh and keep a good week in the fridge as do their salad leaves. Staples like onions and celery are also of a very high quality. I do not bother with the fruit - it was always a bit of a disappointment as were the tomatoes. Abel and Cole are advertising strawberries claiming they re in season!! Elegran we know the people at East Coast well and go to their open days which are super fun. I agree with your son that bananas and oranges are imported but all the root veg and green things are grown in east Lothian. It surprises me that people generally assume we eat organic where possible for our health sake but it's so important for the health of the soil and ultimately the earth and the future. We grow what we can but some things just don't grow in Scotland even in polytunnels. We use Riverford and they are quite flexible if you want to cancel for a few weeks or change to a different box. They recently introduced veg alerts if your usual box has something you don't like but you can't substitute something you do like! They are pricey so we get a box around once a month. 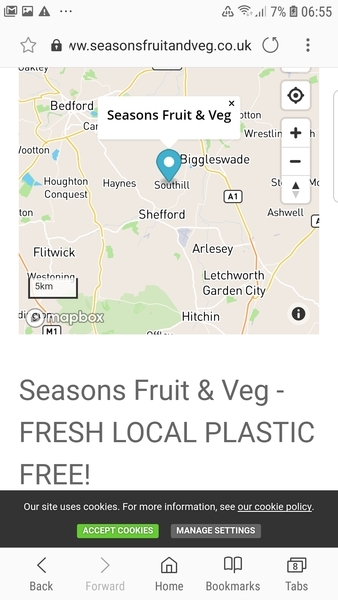 If I knew a local supplier to go to direct I would but there aren't many farms or outlets I know of in North West London. 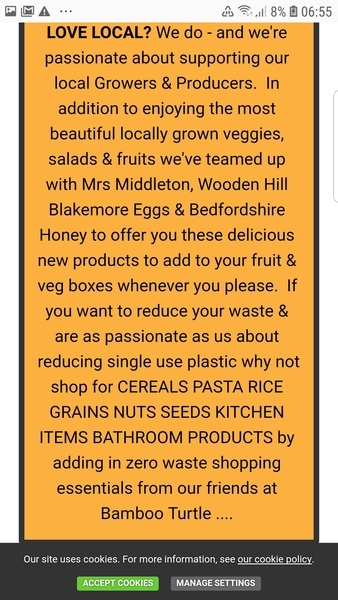 Here's a company which delivers locally sourced fruit, veg, honey and much more to your area on Mondays and Fridays. I've included screenshots from their website. I love fresh food without the air-miles and I've travelled from Guildford to Blackheath and Borough Markets and many many others in the London area as well as my many local weekly markets. It's a pleasure to find locally made honey with labels telling you where the bees foraged for their nectar and herbs from the grower who will have a much larger variety than any shop and you can ask questions, which you can't do with a delivered box.